Applications are now open for the 2019 Mehta Fellowships to PROMYS. PROMYS 2019 will run from 30 June – 10 August. 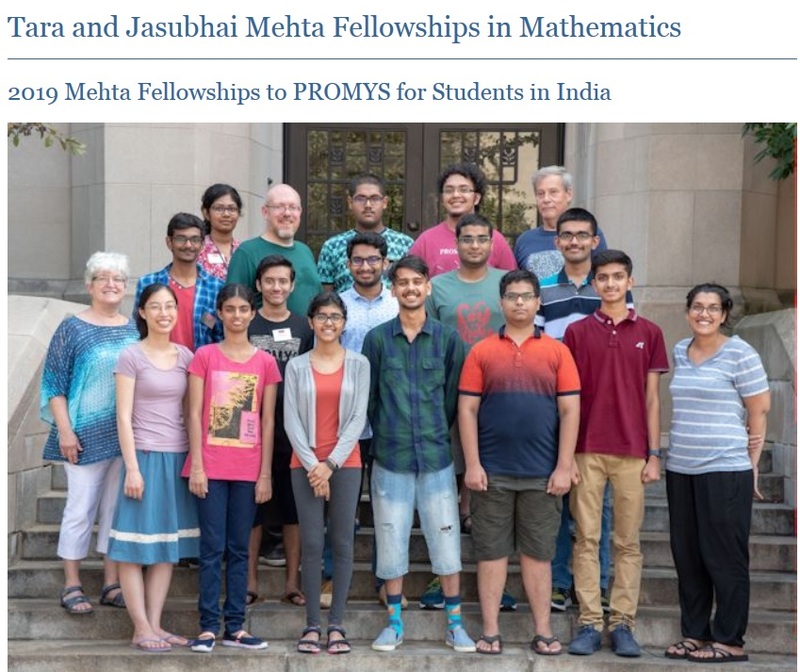 The Tara and Jasubhai Mehta Fellowships to PROMYS are for mathematically talented students in India who would be financially unable to attend PROMYS without a scholarship and travel assistance. 2019 will be the fifth year of the Mehta Fellowships and the 31th summer of PROMYS. 1) Indian citizen and/or Indian resident between 14 and 19 years of age (inclusive) at the start of PROMYS. 2) Student at high school/secondary school in India in grades 9 – 12 (Standards IX-XII, +1, +2, or PUC) when applying. 5) Proficient in English – Able to participate fully in mathematical discussions held entirely in English. Just follow the below steps to apply for the Tara & Jasubhai Mehta Fellowships in Mathematics 2019. Step 2 : Read the instructions carefully and fill the application with the required fields. Step 3 : Upload the necessary documents to the application. Step 4 : Finally click on “Submit” button to complete the application. ** Your solutions (or attempted solutions) to the application problems. ** A copy of your school transcript (this does not need to be an official copy). 2. 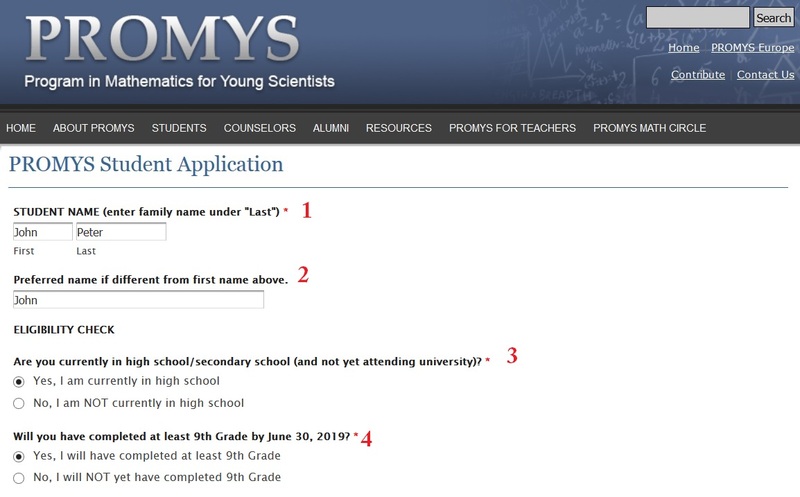 Your application will not be complete until we also receive an online Teacher Recommendation Form submitted by one of your mathematics teachers. 3. Please be aware that you will be unable to save this application before it is submitted. When you submit this form, you will automatically be sent an email with a copy of your responses. 1) PROMYS lectures, discussions, and problem sets are in English; participants should possess English language skills which are strong enough to enable full participation. 2) For some students, school attendance dates will conflict with PROMYS participation dates. PROMYS is happy to assist students in explaining to their schools the academic advantages of participation in the program. 3) The mathematical material that students tackle at PROMYS is very challenging, and participants are expected to enjoy working intensively in mathematics; but students do not need to have taken any advanced or accelerated mathematics courses to thrive at PROMYS. 4) PROMYS is a co-educational program. Male and female students are supervised and supported by same gender counselors and sleep in gender-separated areas of Boston University campus housing. 5) Many domestic students at PROMYS receive full or partial need-based financial aid. Mehta Fellows receive full scholarships. 6) Although the majority of PROMYS students and counselors are from the United States, there are always a number of international students and counselors as well. Over the past 30 years, there have been students and counselors from at least 48 different countries – including India. 7) Mehta Fellows will be provided with bed linens and towels during the program. 8) Laptops are not needed at PROMYS. Students who wish to do so may use Boston University desktop computers at no charge. 9) PROMYS students eat their meals in a cafeteria at Boston University. Vegetarian options are always available.